Intermountain Healthcare is committed to helping people live their healthiest lives. Based in Salt Lake City, Utah, the not-for-profit system of 22 hospitals and 185 clinics employs some 1,400 physicians, Stroke Telehealth for stroke care, a health plan division called SelectHealth, and other health services. Intermountain is widely recognized as a leader in clinical quality improvement and in efficient healthcare delivery. But when a patient arrived at a hospital with stroke symptoms, finding the right doctor/neurologist used to take five minutes or more. 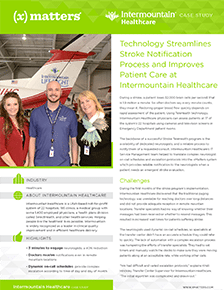 Watch this video to learn how the IT department and xMatters partnered with the medical team to develop a custom form that enables Intermountain Healthcare to find the right physician and assist patients with stroke care in less than three minutes.